On March 27, 2002, the Cubs traded Willis (then a minor leaguer), fellow pitchers Julián Tavárez and José Cueto, and catcher Ryan Jorgensen to the Florida Marlins, in exchange for pitchers Matt Clement and Antonio Alfonseca. Willis was named Rookie of the Month for the month of June and became the first Marlins pitcher to be named Pitcher of the Month. He became the first rookie pitcher to win Pitcher of the Month since Hideo Nomo did it in 1995 for the Los Angeles Dodgers and he became the first rookie pitcher to win seven straight starts since Jason Isringhausen, also in 1995. In 5 starts, Willis went 5–0 with a 1.04 ERA. Heading into the All-Star Break in mid-July, Willis was 9–1 with a 2.08 ERA in 13 starts. He made the National League All-Star team as injury replacement for Los Angeles Dodgers pitcher Kevin Brown. He became the second Marlins rookie player to make the All-Star team; Alex González did it in 1999. On July 7, Willis hit a grand slam off of Mets pitcher José Lima. Willis became the first pitcher to hit a grand slam since Robert Person did it in 2002. It was his fourth career home run. 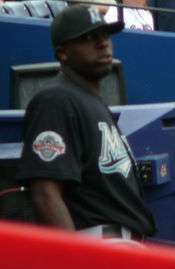 On September 20, 2006 he hit 2 home runs, off of Óliver Pérez and Roberto Hernández. He became the first pitcher since Randy Wolf to hit 2 home runs in a game. Willis signed a minor league contract with the Baltimore Orioles five days later on March 21. A left forearm strain suffered on April 12 led to a dispute with the organization which wanted him to be a relief pitcher. Desiring to be a starter again, he placed the blame for the injury on working out of the bullpen. In his only start after the problem was resolved, he surrendered four runs and six hits in 2⅔ innings pitched. He made four appearances with the Norfolk Tides, going 0–3 with an 8.53 ERA while allowing eight runs and ten hits in 6⅓ innings. He announced his retirement as an active player on July 2, 2012. ↑ "Cubs trade for reliever Alfonseca". Philadelphia Inquirer. March 28, 2002. Retrieved January 22, 2015. ↑ "Colorado Rockies vs. Florida Marlins – Box Score – May 9, 2003". Espn.com. Associated Press. June 9, 2013. Retrieved June 9, 2013. ↑ "Pudge's HR all the support stingy Willis needs". Espn.com. Associated Press. June 9, 2013. Retrieved June 9, 2013. ↑ "Willis wins Pitcher, Rookie of Month". MLB.com. Associated Press. June 13, 2013. Retrieved June 13, 2013. ↑ "Dontrelle Willis Stats, Splits". Espn.com. Associated Press. June 13, 2013. Retrieved June 13, 2013. ↑ "Dontrelle Willis Stats, Splits – ESPN". Espn.com. Associated Press. June 9, 2013. Retrieved June 9, 2013. ↑ "Dontrelle-mania to hit All-Star game Willis named to All-Star game to replace Brown". MLB.com. Associated Press. June 13, 2013. Retrieved June 13, 2013. ↑ "Spivey's errant throw helps Willis win 10th". Espn.com. Associated Press. June 9, 2013. Retrieved June 9, 2013. ↑ "San Francisco Giants vs. Florida Marlins – Box Score – October 4, 2003". Espn.com. Associated Press. June 9, 2013. Retrieved June 9, 2013. ↑ "Chicago Cubs vs. Florida Marlins – Box Score – October 11, 2003". Espn.com. Associated Press. June 9, 2013. Retrieved June 9, 2013. ↑ "Baseball Awards Voting for 2003". Retrieved 2010-07-24. ↑ "Willis 3-for-3 with HR; Cabrera homers again". Espn.com. Associated Press. June 9, 2013. Retrieved June 9, 2013. ↑ "Willis strikes out in first at-bat". Espn.com. Associated Press. June 9, 2013. Retrieved June 9, 2013. ↑ "Dontrelle Willis Game By Game Stats and Performance". Espn.com. ESPN Internet Ventures. Associated Press. June 9, 2013. Retrieved June 9, 2013. ↑ "Colorado matches third-longest losing skid in team history". Espn.com. Associated Press. June 9, 2013. Retrieved June 9, 2013. ↑ "Delgado drives in all five runs as Marlins snap skid". Espn.com. Associated Press. June 9, 2013. Retrieved June 9, 2013. ↑ "Willis is NL's first 12-game winner". Espn.com. Associated Press. June 9, 2013. Retrieved June 9, 2013. 1 2 "Dontrelle Willis Stats, Splits = ESPN". Espn.com. Associated Press. June 13, 2013. Retrieved June 13, 2013. ↑ "Chicago Cubs vs. Florida Marlins – Box Score – July 8, 2005". Espn.com. Associated Press. June 13, 2013. Retrieved June 13, 2013. ↑ "Dontrelle Willis Game By Game Stats and Performance". Espn.com. Associated Press. June 13, 2013. Retrieved June 13, 2013. ↑ "Willis fans seven, allows three hits". Espn.com. Associated Press. June 13, 2013. Retrieved June 13, 2013. ↑ "Willis leads majors in shutouts with five". Espn.com. Associated Press. June 9, 2013. Retrieved June 9, 2013. ↑ "Willis breaks Marlins record for wins in season". Espn.com. Associated Press. June 13, 2013. Retrieved June 13, 2013. ↑ "D-Train chugs to 20th win as Marlins rout Nationals". Espn.com. Associated Press. June 9, 2013. Retrieved June 9, 2013. ↑ "Willis gets major league-leading 22nd win=ESPN Internet Ventures". Espn.com. Associated Press. June 9, 2013. Retrieved June 9, 2013. 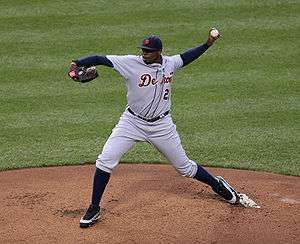 1 2 "Dontrelle Willis Statistics and History". Baseball-Reference.com. Baseball-Reference.com. Associated Press. June 3, 2013. Retrieved June 3, 2013. ↑ "D-Train's near-CG powers Marlins to ninth straight win". Espn.com. Associated Press. June 9, 2013. Retrieved June 9, 2013. ↑ "Marlins ride D-Train grand slam, pitching past Mets =ESPN Internet Ventures". Espn.com. Associated Press. June 9, 2013. Retrieved June 9, 2013. ↑ "Do-it-all Dontrelle: Marlins P cools Mets, hits two HRs". Espn.com. Associated Press. June 9, 2013. Retrieved June 9, 2013. ↑ "Dontrelle Willis: first pitcher since 2004 to hit two home runs in a game". Smoaky.com. cheaptrick77. Associated Press. June 9, 2013. Retrieved June 9, 2013. ↑ "Dontrelle Willis Statistics and History". Baseball-Reference.com. Baseball-Reference.com. Associated Press. June 3, 2013. Retrieved June 3, 2013. ↑ "Yearly League Leaders and Records for Earned Runs". Baseball-Reference.com. Baseball-Reference.com. Associated Press. June 3, 2013. Retrieved June 3, 2013. ↑ "White Sox touch up Willis, drop new-look Tigers to 0-5". Espn.com. Associated Press. June 9, 2013. Retrieved June 9, 2013. ↑ "Cabrera drives in four runs as Tigers topple Royals". Espn.com. Associated Press. June 9, 2013. Retrieved June 9, 2013. ↑ Gilbert, Steve (June 1, 2010). "D-backs get Willis from Tigers for Buckner". MLB.com. Retrieved June 1, 2010. ↑ "D-backs designate Willis". espn.com. Associated Press. July 4, 2010. Retrieved July 6, 2010. ↑ "Morton shines as Pirates beat Reds 2-0". sports.yahoo.com. Will Graves. Associated Press. June 9, 2013. Retrieved June 9, 2013. ↑ Gelb, Matt (December 13, 2011). "Phillies sign Dontrelle Willis to 1-year deal". Philadelphia Inquirer. Retrieved January 22, 2015. ↑ "Orioles sign LHP Dontrelle Willis to minor league contract", Baltimore Orioles press release, Wednesday, March 21, 2012. ↑ Seidel, Jeff. "Willis files grievance", MLB.com, Wednesday, April 25, 2012. ↑ Ghiroli, Brittany. "Orioles announce D-Train has retired", MLB.com, Monday, July 2, 2012. ↑ Rosecrans, C. Trent (January 4, 2013). "Cubs sign Dontrelle Willis to minor-league deal". CBS Sports. Retrieved January 22, 2015. ↑ Ortiz, Jorge L. (February 25, 2013). "Dontrelle Willis' comeback with Cubs lasts seven pitches". USA Today. Retrieved January 22, 2015. ↑ Short, D.J. (March 30, 2013). "Cubs release Dontrelle Willis and former first-round pick Hayden Simpson". NBC Sports. Retrieved January 21, 2015. ↑ "DONTRELLE WILLIS JOINS LONG ISLAND". LIducks.com. April 5, 2013. ↑ Musarra, Casey (August 4, 2013). "Ducks' Dontrelle Willis signed by Angels". Newsday. Retrieved January 22, 2015. ↑ Haft, Chris (January 10, 2014). "Willis gets Minor League deal from Giants". MLB.com. Retrieved January 22, 2015. ↑ Malafronte, Chip (July 8, 2014). "A passion for baseball still drives Dontrelle Willis". New Haven Register. Retrieved January 22, 2015. ↑ Clark, David (July 6, 2014). "Ex-Red Dontrelle Willis signs with Bridgeport Bluefish". Cincinnati Enquirer. Retrieved January 22, 2015. ↑ "Dontrelle Willis to Make Bluefish Debut July 18". Atlantic League of Professional Baseball Clubs. July 18, 2014. Retrieved January 22, 2015. ↑ Gleeman, Aaron (July 17, 2014). "Dontrelle Willis is playing for the Bridgeport Bluefish now". NBC Sports. Retrieved January 22, 2015. ↑ Nowak, Joey (January 21, 2015). "Willis reportedly agrees to deal with Brewers". MLB.com. Retrieved January 21, 2015. 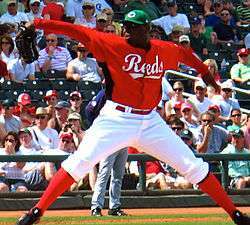 ↑ "Brewers sign lefty Dontrelle Willis to minor league deal". ESPN.com. Associated Press. January 21, 2015. Retrieved January 22, 2015. ↑ Rodriguez, Juan C. (March 13, 2015). "Former Marlins sensation Dontrelle Willis announces retirement". Miami Sun-Sentinel. Retrieved March 13, 2015. ↑ "ESPN – Carpenter wins National League Cy Young Award – MLB". sports.espn.go.com. Retrieved 2008-06-10. ↑ "The Official Site of The Florida Marlins: News: Notes: Willis elevated in order again". florida.marlins.mlb.com. Retrieved 2008-06-10. ↑ "The Official Site of The Florida Marlins: News: Willis garners 2005 Spahn Award". florida.marlins.mlb.com. Retrieved 2008-06-10. 1 2 Rodriguez, Juan C. (December 23, 2006). "Willis Charged With Dui". Sun-Sentinel. Retrieved 6 August 2015. ↑ "Baseball: Pitcher pleads guilty to reckless driving". The Honolulu Advertiser. Associated Press. April 15, 2008. Retrieved 6 August 2015.